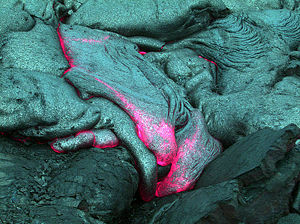 Hawaiian lava flow (lava is the extrusive equivalent of magma). Magma is molten rock located beneath the surface of the Earth. This complex, high-temperature fluid often collects in a magma chamber and may contain suspended crystals and gas bubbles. Upon cooling, it solidifies to form igneous rock. Magma is capable of intrusion into adjacent rocks, extrusion onto the surface as lava, or ejected explosively as tephra to form pyroclastic rock. The study of magma helps us understand the structure, composition and evolution of the Earth's crust and mantle over geological time. The melting of solid rock to form magma is controlled by three physical parameters: its temperature, pressure, and composition. The composition of magma is commonly correlated with the environment of its formation. The environment can be of a range of types, including subduction zones, continental rift zones, mid-oceanic ridges, and hotspots, some of which are interpreted as mantle plumes. After formation, magma compositions may evolve by such processes as fractional crystallization, contamination, and magma mixing. At any given pressure and for any given composition of rock, a rise in temperature past the solidus will cause melting. Within the solid earth, the temperature of a rock is controlled by the geothermal gradient and radioactive decay within the rock. The geothermal gradient ranges from five to ten °C/km (degrees Celsius per kilometer) within oceanic trenches and subduction zones to 30-80 °C/km under mid-ocean ridges and volcanic arc environments. Melting can also occur when a rock rises through the solid earth, by a process known as decompression melting. It is usually difficult to change the bulk composition of a large mass of rock, so composition is the basic control on whether a rock will melt at a given temperature and pressure. The composition of a rock may also be considered to include volatile phases such as water and carbon dioxide. The presence of volatile phases in a rock under pressure can stabilize a melt fraction. The presence of even one percent water may reduce the temperature of melting by as much as 100 °C. Conversely, the loss of water and volatiles from a body of magma may cause it to essentially freeze or solidify. When rocks melt, they do so gradually. Most rocks are made of several minerals, all of which have different melting points, and the phase diagrams that control melting are usually complex. As a rock melts, its volume changes. When a sufficient quantity of small globules of melt have formed (generally between mineral grains), these globules link up and soften the rock. Under pressure within the Earth, as little as a fraction of a percent partial melting may be sufficient to cause the melt to be squeezed from its source. Melts can stay in place long enough to melt to 20 percent or even 35 percent. Yet, rocks are rarely melted in excess of 50 percent, because eventually the melted mass becomes a mix of crystals and melt mush that can ascend en masse as a diapir, which may then lead to further decompression melting. When a rock melts, the liquid is known as a primary melt. Primary melts have not undergone any differentiation and represent the starting composition of a body of magma. In nature, it is rare to find primary melts. The leucosomes of migmatites are examples of primary melts. Primary melts derived from the mantle are especially important, and are known as primitive melts or primitive magmas. By finding the primitive magma composition of a magma series, it is possible to model the composition of the mantle from which a melt was formed. This approach is useful to help us understand the evolution of the Earth's mantle. A parental melt is a magma composition from which the observed range of magma chemistries has been derived by the processes of igneous differentiation. It need not be a primitive melt. When it is impossible to find the primitive or primary magma composition, it is often useful to attempt to identify a parental melt. For instance, a series of basalt flows may to be related to one another. A composition from which they could reasonably be produced by fractional crystallization is called a parental melt. Fractional crystallization models may be formulated to test the hypothesis that they share a common parental melt. The degree of partial melting is critical for determining the type of magma produced. One can estimate the degree of partial melting needed to form a melt by considering the relative enrichment of incompatible elements versus compatible elements. Incompatible elements commonly include potassium, barium, cesium, and rubidium. Rock types produced by low levels of partial melting in the Earth's mantle are typically alkaline (Ca, Na), potassic (K), or peralkaline (with a high ratio of aluminum to silica). Typically, primitive melts of this composition form lamprophyre, lamproite, and kimberlite. Sometimes they form nepheline-bearing mafic rocks, such as alkali basalts and essexite gabbros or even carbonatite. Pegmatite may be produced by low levels of partial melting of the crust. Some granite-composition magmas are eutectic (or cotectic) melts, and they may be produced by various degrees of partial melting, as well as by fractional crystallization. At high degrees of partial melting of the crust, granitoids (such as tonalite, granodiorite, and monzonite) may be produced, although they are typically produced by other mechanisms. At high degrees of partial melting of the mantle, komatiite and picrite are produced. Temperatures of most magmas are in the range 700 °C to 1300 °C, but rare carbonatite melts may be as cool as 600 °C, and komatiite melts may have been as hot at 1600 °C. Most are silicate solutions. Silicate melts are composed mainly of silicon, oxygen, aluminum, alkali metals (sodium, potassium), calcium, magnesium, and iron. As in almost all silicate minerals, silicon atoms are in tetrahedral coordination with oxygen, but the atomic order in melts is preserved over only short distances. The physical behavior of melts depends on their atomic structures as well as on temperature, pressure, and composition. Viscosity is a key melt property in understanding the behavior of magmas. Melts that are richer in silica are typically more polymerized, with greater linkage of silica tetrahedra, and are therefore more viscous. Dissolution of water drastically reduces melt viscosity. Higher-temperature melts are less viscous. Magmas that are more mafic, such as those that form basalt, are generally hotter and less viscous than those that are more silica-rich, such as magmas that form rhyolite. Low viscosity leads to gentler, less explosive eruptions. ↑ A magma chamber is a large pool of magma lying beneath the surface of the Earth's crust. The molten rock in such a chamber is under great pressure and may gradually fracture the rock around it. If it finds a way to the surface, the result is a volcanic eruption. ↑ Environments and mechanisms of formation are discussed in the entry on igneous rock. ↑ E. B. Watson, M. F. Hochella, and I. Parsons, eds. "Glasses and Melts: Linking Geochemistry and Materials Science" Elements. October 2006, 259-297. Retrieved October 23, 2007. Blatt, Harvey, and Robert J. Tracy. 1995. Petrology: Igneous, Sedimentary, and Metamorphic. 2nd ed. New York: W.H. Freeman. ISBN 0716724383. McBirney, Alexander R. 2006. Igneous Petrology. 3rd ed. Sudbury, MA: Jones and Bartlett. ISBN 0763734489. Sigurdsson, Haraldur, Bruce Houghton, Stephen R. McNutt, Hazel Rymer, and John Stix, eds. 2000. Encyclopedia of Volcanoes. San Diego, CA: Academic Press. ISBN 012643140X. Skinner, Brian J., Stephen C. Porter, and Jeffrey Park. 2004. Dynamic Earth: An Introduction to Physical Geology. 5th ed. Hoboken, NJ: John Wiley. ISBN 0471152285. This page was last modified on 28 August 2014, at 23:04.